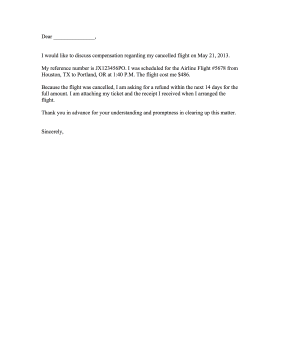 This printable airline complaint letter requests a refund due to a cancelled flight. I would like to discuss compensation regarding my cancelled flight on May 21, 2013. My reference number is JX123456PO. I was scheduled for the Airline Flight #5678 from Houston, TX to Portland, OR at 1:40 P.M. The flight cost me $486. Because the flight was cancelled, I am asking for a refund within the next 14 days for the full amount. I am attaching my ticket and the receipt I received when I arranged the flight. Thank you in advance for your understanding and promptness in clearing up this matter.